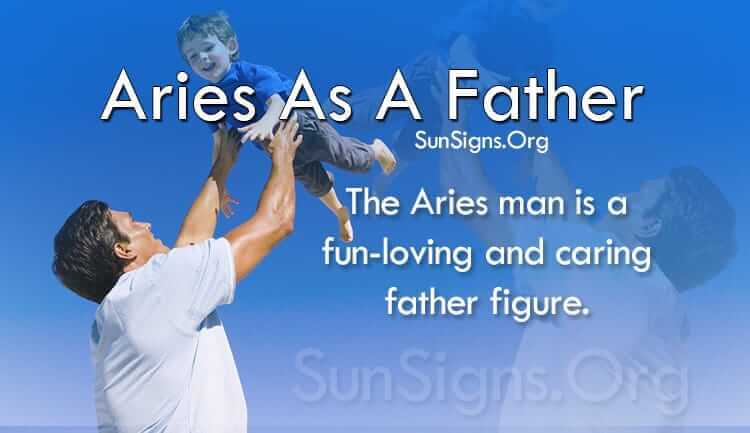 A fun-loving and caring father figure, the Aries father personality handles children very well and immensely enjoys his time raising them. However, The Aries man may become controlling and overprotective as his children sprout into adolescents and gain more personal freedom. After all, raising teenagers is difficult enough without them getting into trouble! The Aries male seeks excitement, adventure and entertainment in life. These qualities are also what he seeks in parenthood. He wants to have fun being with his family and taking care of his children without the stress of feeling like it is a chore. The biggest advantage of having an Aries as a father is the fact that there is never a dull moment with him. He will not hesitate to book a fun family vacation to Hawaii or take everyone out on a nice, relaxing weekend trip. He loves making his children happy and will do whatever it takes to achieve that. He wants his children to be bold and adventurous and take life by the horns. Of course, the Aries father personality traits show he also expects them to be honest, good-natured and fun-loving just like him! Like the Aries mother, he takes pride in his children and loves to show them off. It helps the children build confidence, self-esteem and to show them that you can earn bragging rights through hard work. However, the Aries dad traits show his pride can quickly become distasteful so he will need to be mindful of the bragging. It is not easy to be around someone who is so arrogant! Lend the Aries father personality a helpful hand and a lesson in modesty and humility. A little can go a long way and the children will gladly follow in their daddy’s positive footsteps. By nature, the Aries man feels a need to be in control of and manage everything that goes on around him. The Aries father traits show he wants to have his voice heard and have his say count as the golden rule. As the children blossom into lovely young adolescents, they will gain a lot more personal freedom than they’ve had in their childhood. Needless to say, there will be a few broken curfews, reprimanding calls from school and they may find themselves a young companion. The Aries father personality traits show he will feel like his kids are no longer abiding by his rules. He will have a tendency to become overprotective and controlling. This is a rough time for him because his children are getting older and becoming individuals that may not be in line with what he had in mind for them. The Aries father characteristics show he will “lash out” by demanding his kids to come home directly after school or to give him detailed reports of their whereabouts frequently if they do go out. Good intentions are behind this behavior but are simply expressed in a less than ideal way. The Aries parent is also highly competitive. He believes that he IS the champion and always will be. He refuses to play second fiddle to anyone else and will charge his way to the top as necessary. The Aries father characteristics show he loves being the best but does not handle it well at all when he fails to achieve that goal. Coupled with an alarming temper, it will be a strenuous journey taming that side of Aries men. It is important to let him know when he is overreacting and work with him to find a way to approach these situations.